You can enter tables of data, numerically transform the data, and graph data in two and three dimensions. You can rotate a curve around an arbitrary axis to generate a surface in three dimensions. 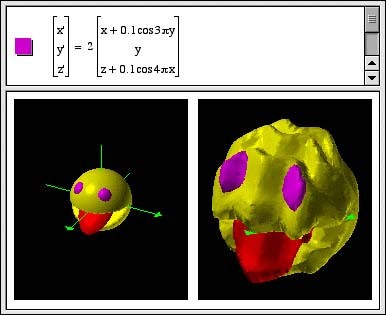 You can graph ODEs in three dimensions. You can specify initial conditions for ODEs by giving starting points on surfaces. Vector fields can be graphed on surfaces. A complex function of a real parameter, z, specifies a curve in 3D. 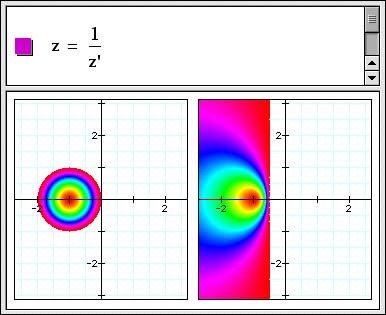 Observe that this is the same complex function as in the 2D example above, but here the parameter z is used as the third 3D coordinate. In this example, observe the four zeros at +1, -1, +i, and -i. (x, y, Re f(x+ iy), Im f(x + iy)) and then project this surface to the screen in a manner similar to the way we project 3-D surfaces onto a 2-D screen. Note that in the following, z=x+iy and w=u+iv. In the following example, you can drag the purple dot, which moved the square grid along with it. 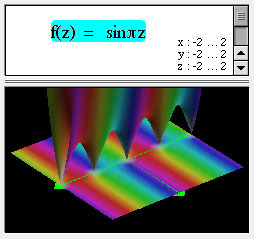 The blue grid is the map of the square grid under the complex function f(z). You can specify the color at each point in the place by giving functions for either the (red, green, blue) or the (hue, saturation, value) components of the color. The following shows a hypercube in four dimensions specified by writing the 32 edges between its 16 vertices. The min() function returns the minimum of its arguments. The max function returns the maximum of its arguments. mod(a,b) return the remainder of a divided by b.
clamp(x,a,b) pins x to the range [a,b]. Type command-option-d to draw unit vectors in a vector field. Version 3.1 ships with example and template documents which are also accessible from the new Examples menu. The preferences dialog now gives control over the background used with 3D objects. Copy as Text on produces sum(x^k/k!,k=0,5). Fractional powers of negative numbers are handled properly now. If you would like to help test pre-release development versions of our products, subscribe to our mailing lists here.